CEDRIK FERMONT (aka C-drík Fermont, C-drík, Cdrk, Kirdec, Y-drík, M-drík, F-drík and many other “-drík”) is a multifaceted vegan artist, academically trained musician, DJ, singer, composer and drummer. Of Greek, Zairian and Belgian descent, born in Zaire (RDC), he lived in Belgium, where he studied under the guidance of electro-acoustic composer Annette Van de Gorne, before relocating to the Netherlands, then to Germany in 2010. C-drík started his first electronic project in 1989, and juggles between different musical genres, including electronica, noise, breakcore, digital punk, electro-acoustic, industrial, ambient, free jazz, hip hop, etc. 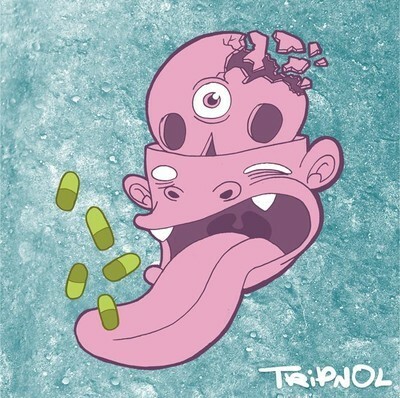 He is also a label manager and promoter, producing his own projects and those of similarly-minded experimental artists, mostly from Asia and Africa. 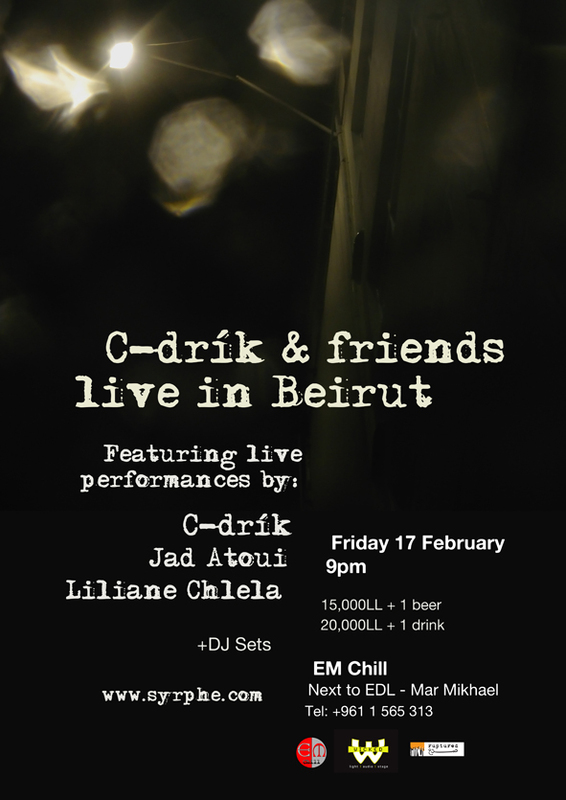 Tashweesh is an audio-visual performance group from Ramallah, Palestine, which brings together installation artists Basel Abbas and Ruanne Abou-Rahme and musician boikutt, in a joint performance that combines sound, music and image. The result is an exploration of the collision between sound and video field recordings, archive material, vocals, breaks and soundscapes. 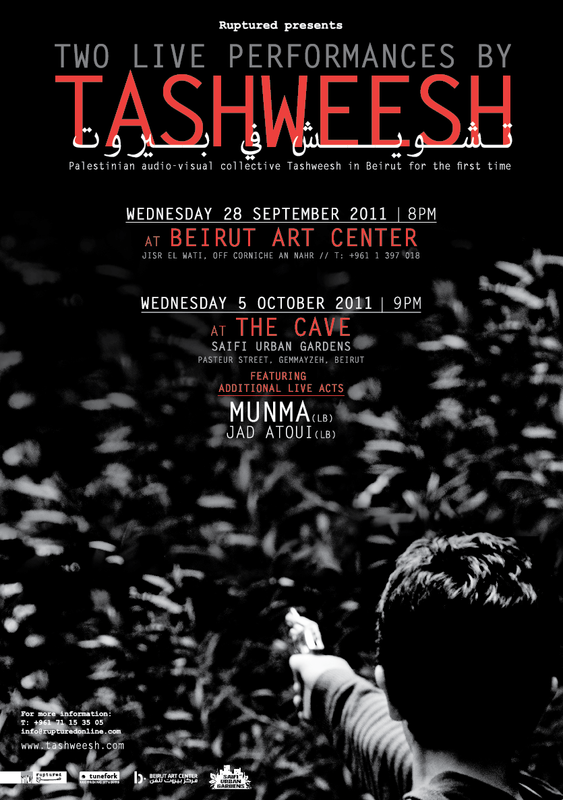 Performing in Beirut for the first time, Tashweesh will present a premiere of their most recent set, following 2010’s performances in venues such as CCA (Glasgow), SouthBank Centre (London), Danish Film Institute (Copenhagen), Images Festival (Copenhagen) and Re:View (Katowice). 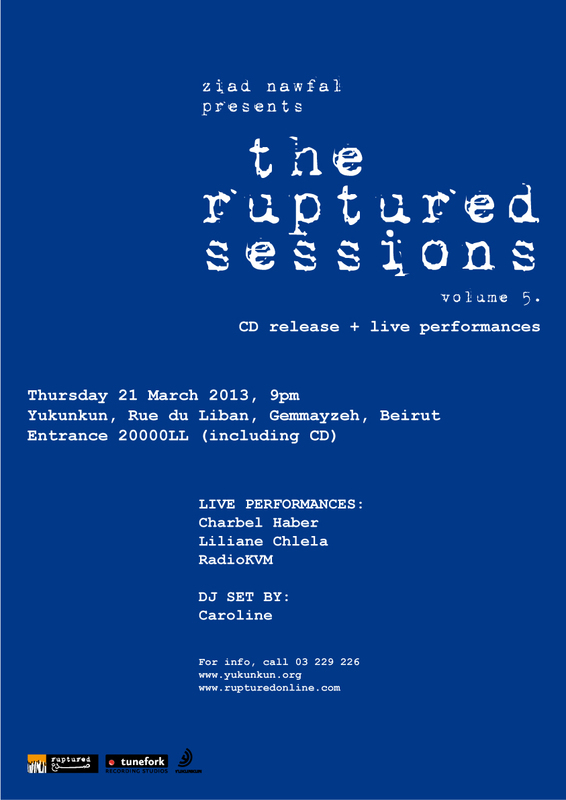 Lebanese musician Ziad M. Moukarzel, aka Mocques, was the guest of Ruptures for an interview + live electronic performance. 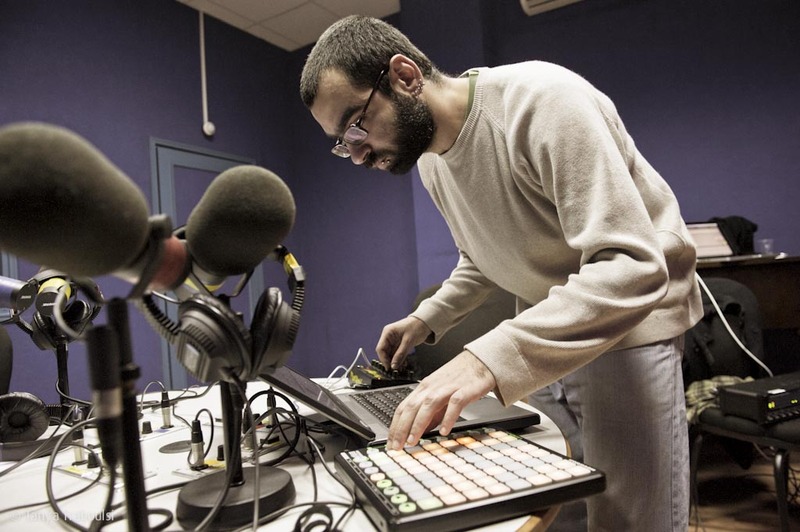 Mocques’ ‘Ruptured’ showcase took place a couple of weeks following his first solo concert in Beirut, during which he played alongside local musicians Munma and Jad Atoui, and foreign musicians Kirdec (Belgium) and One Man Nation (Singapore). 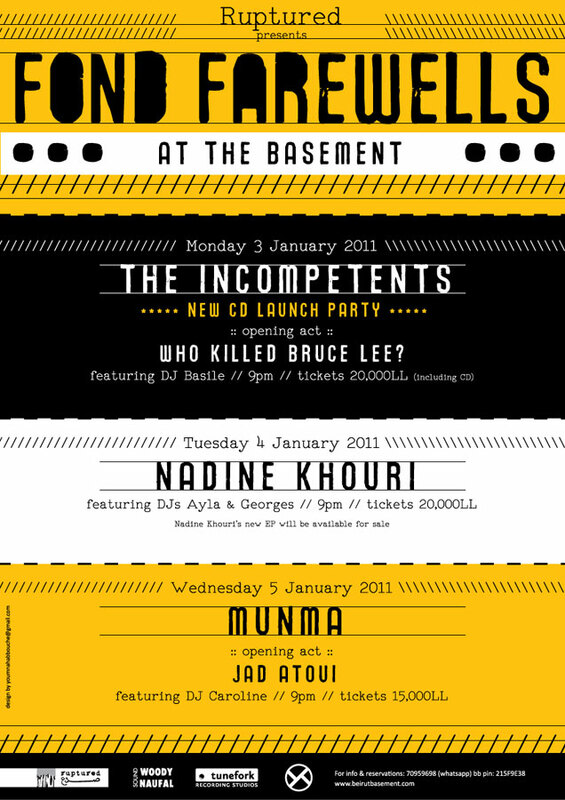 Opening by WHO KILLED BRUCE LEE?